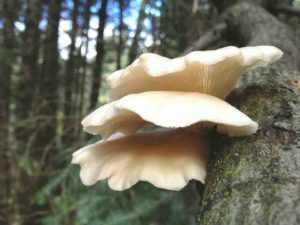 Pleurotus ostreatus or Oyster mushrooms are a common edible mushroom. These mushrooms are very healthy and tasty. They lower cholesterol levels and even fight for cancer. They also clean up the environment in a nice way. Recently these mushrooms have become very popular among food lovers and vegetarians. They are easy to grow and you can do it even at your own home. They don’t need a lot of space it can even be done in a cardboard. Here are some easy steps to identify these mushrooms. Cap: It has white to light brown color. And has white flesh. Spore: It’s usually white to lilac gray. Habitant: they are usually found around hardwoods.